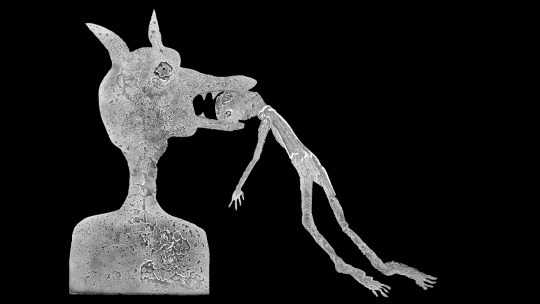 Pearly Oyster's short film ROGER BALLEN'S THEATRE OF APPARITIONS is a twisted little film getting its world premiere at the Edinburgh International Film Festival this June. The film was commissioned by photographer and star Ballen and is created and animated using his original artwork and was - directed by Emma Calder & Ged Haney. I'm guessing that should any one with official power the see the film they will soon be locked away some where safe where they can't get near sharp objects or film equipment because they will think they are crazy people. Of course if that happens I'm guessing the audiences who see the film will quickly bust them out of prison because they will know that the trio are truly great artists. I know I'd make the effort to release them since the film they have made is a truly magical experience. It is impossible to describe what exactly the film is. 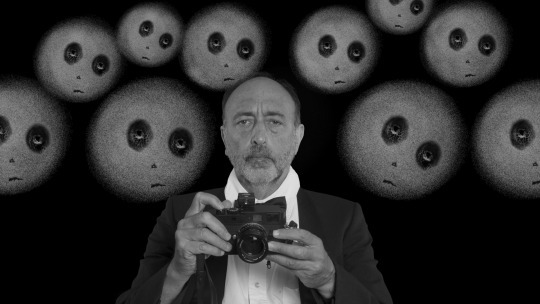 A feeble attempt would to liken it to watching some ones dream, Roger Ballen wakes up and we are treated to various acts or dreams that are based on his photography. They are twisted and nightmarish...and amazing. And please don't worry whatever I say won't ruin what the film is because the visuals are so powerful they lessen any words used to describe them. Calder and Haney have made a glorious little confection.Its a visceral little treat that scratches and claws its way into your subconscious where it curls up and creates a nest for itself. For the two days that followed seeing the film I kept going back to it in my head-usually at the odd random moment where it popped up and had me audibly saying "that was messed up". The murmuring resulted in odd looks when I was doing it while looking at Edward Hicks Peaceable Kingdom at the Brooklyn Museum. I absolutely love this film. The five minutes the film runs is not enough- or maybe it is since I don't know what effect the film would have on its audience if it ran longer. We all might be trucked away. 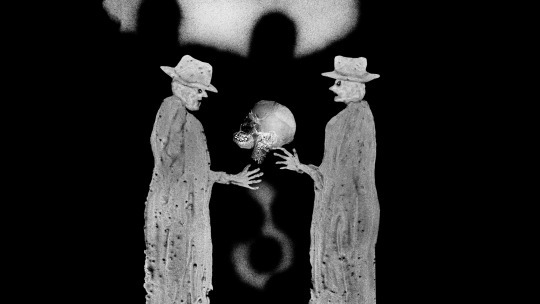 More likely we would all fall under the thrall of director Emma Calder Ged Haney and end up clamoring for their next film...then again if you see THEATRE OF APPARITIONS that's exactly what is going to happen. The film World Premieres at Edinbugh on June 23 as part of ‘The McLaren Award: New British Animation 2’. For tickets and more information go here.